Bernie Ecclestone has been removed from his position running Formula 1 as US giant Liberty Media completed its $8bn (£6.4bn) takeover of the sport. Ecclestone, 86, who has been in charge for nearly 40 years, has been appointed chairman emeritus and will act as an adviser to the board. Chase Carey has had Ecclestone's former role of chief executive officer added to his existing position of chairman. Ecclestone said earlier on Monday he had been "forced out". He told Germany's Auto Motor und Sport: "I was dismissed. This is official. I no longer run the company. My position has been taken by Chase Carey." 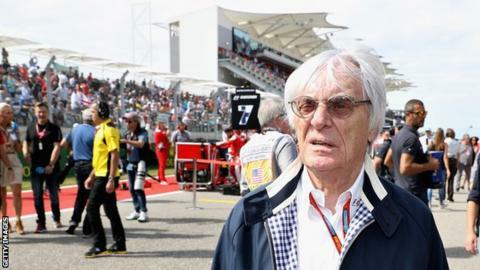 Ecclestone, who added he did not know what his new job title meant, declined to comment when approached by BBC Sport, who revealed on Sunday he would leave his job this week. Liberty began its takeover of the sport in September and earlier in January cleared the last two regulatory hurdles. The deal was completed on Monday and Liberty Media is to be renamed the Formula 1 Group following the takeover. As well as Brawn's return, former ESPN executive Sean Bratches has been hired to run the commercial side of the sport. Brawn, 62, masterminded all seven of Michael Schumacher's world titles at Benetton and Ferrari and also won the championship with Jenson Button with his own team in 2009. He then moved to Mercedes, where he laid the foundations for Lewis Hamilton and Nico Rosberg's title wins. Both he and Bratches will report to Carey, a former long-time lieutenant of media mogul Rupert Murdoch and chairman of his 21st Century Fox company. Bernie Ecclestone: "I'm proud of the business that I built over the past 40 years and all that I have achieved with Formula 1. I would like to thank all of the promoters, teams, sponsors and television companies that I have worked with. "I'm very pleased that the business has been acquired by Liberty and that it intends to invest in the future of F1. I am sure that Chase will execute his role in a way that will benefit the sport." Chase Carey: "I am excited to be taking on the additional role of CEO. F1 has huge potential with multiple untapped opportunities. I have enjoyed hearing from the fans, teams, [governing body] FIA, promoters and sponsors on their ideas and hopes for the sport. "I would like to recognise and thank Bernie for his leadership over the decades. The sport is what it is today because of him and the talented team of executives he has led, and he will always be part of the F1 family. "Bernie's role as chairman emeritus befits his tremendous contribution to the sport and I am grateful for his continued insight and guidance as we build F1 for long-term success and the enjoyment of all those involved." Greg Maffei, president and CEO of Liberty Media Corporation: "We are delighted to have completed the acquisition of F1 and that Chase will lead this business as CEO. I'd like to thank Bernie Ecclestone for his tremendous success in building this remarkable global sport." Zak Brown, executive director, McLaren Technology Group: "Formula 1 wouldn't be the international sporting powerhouse that it is today without the truly enormous contribution made over the past half-century by Bernie Ecclestone. Indeed, I can't think of a single other person who has had anything like as much influence on building a global sport as he has. "Today is a day on which we should all pay tribute to a remarkable visionary entrepreneur called Bernie Ecclestone, and to say thank you to him too." Murray Walker, F1 commentator, speaking to BBC Radio 5 live: "Formula 1 owes him an immeasurable debt. He is a very tough businessman but if he shakes your hand you don't need a contract. He's as good as his word. "The most important thing under Bernie's rule was the safety aspect. Formula 1 has been absolutely transformed. There was a time when four or five people were being killed every year but Bernie, with the help of Professor Sid Watkins, transformed that situation." What did Ecclestone do for F1? Ecclestone, the former team boss of Brabham, began in the 1970s as a representative of his colleagues in negotiations with circuits, television and authorities and slowly moved into a position of almost absolute power. He was central in turning F1 from a relatively minority activity into one of the biggest television sports in the world outside the Olympics and the football World Cup. After selling Brabham in the late 1980s, he moved full-time into administration. He took over the ownership of the commercial rights of F1 from the teams in the mid-1990s. He then struck a deal in 2000 with his long-time ally Max Mosley, then president of the FIA, to lease them for 110 years at what critics said was an absurdly low price of $360m (£287m). That set in motion a series of sales where the rights were passed from one entity to another, a process that led Ecclestone to stand trial for bribery in Germany in 2014. The case was dropped after a payment of $100m (£79m) without presumption of guilt or innocence. Subsequently Liberty took over from previous owner CVC Capital Partners. Ecclestone built F1 into a sport that could be valued by one of the world's biggest media groups at $8bn. He did this by building up F1's exposure on television, forcing companies to transmit the whole championship rather than cherry-picking the odd race here and there as had been normal until the early 1980s. But he has been criticised for his authoritarian grip on the sport and his controversial approach. In recent years, his demands for ever-higher fees from race tracks led to several European races struggling to make ends meet. His decision-making was also questioned, particularly over issues such as the introduction of double points for the final race of the 2014 season, and the quickly abandoned change of the qualifying format in 2016. A prize-money structure he created in the early years of this decade is believed by many insiders to be unfairly skewed in favour of the bigger and richer teams, and the governance system he set up at the same time has led to a log-jam when it comes to decision-making. Equally, his public utterances were sometimes ill-advised, such as praising Adolf Hitler for "being able to get things done" and calling women "domestic appliances". And some of his choices of locations for new races were also controversial - in countries such as Bahrain, Russia and Azerbaijan which secured huge fees for CVC but were criticised because of the regimes' records on human rights. What changes does Liberty plan? Liberty has not publicly revealed what changes it will make to F1 but insiders say it plans to act on many of the areas that were considered a weakness under Ecclestone. In particular, it wants to exploit digital media, an area with which Ecclestone refused to engage, and it intends to invest in securing the futures of certain races which it considers valuable. It also wants to grow the sport in the USA, where F1 has long struggled to gain a sure foothold and promote it much more extensively, talking of creating "20 Super Bowls", in terms of making much more of the build-up to each race. Who are Formula 1's new owners? Read more on Liberty Media: Who are Formula 1's new owners?